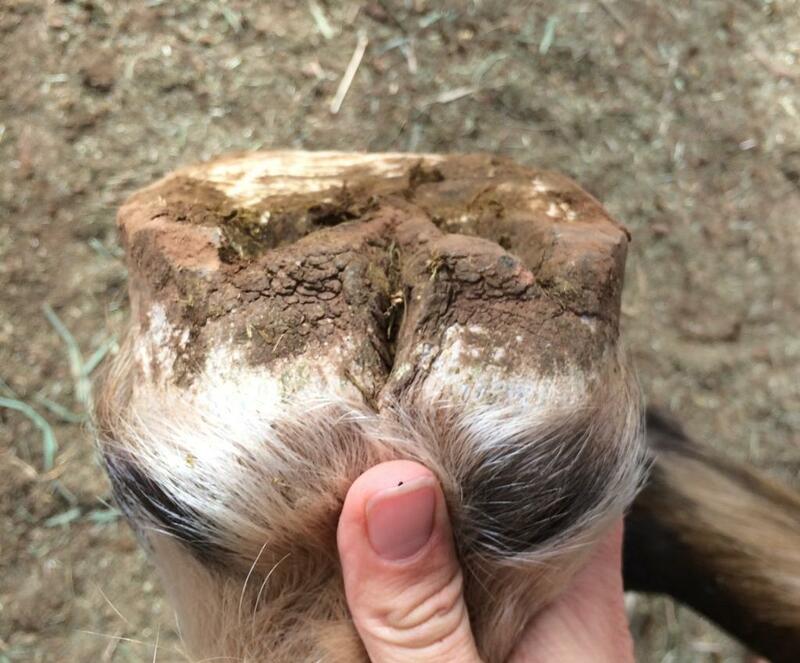 I mentioned that I was going to leave her flaky sole in there and just lower that hoof wall to get her sole more in contact with the ground. I could've knifed out the sole and hacked off a bunch of hoof wall and heel all in one go. I just took these AFTER shots during lunch so she's had 2 days of walking around on them. As you will soon see, they look like they need to be trimmed again! For people who don't want to trim every weekend, this would be a pain in the neck, but I like that her sole shed a bit and her frog shed a bit and she got to move around with the adjustment I made. I like that her change in angles is going to be a little at a time, once a week (for the next few weeks). I had nipped off some serious wall and didn't rasp a thing. I just wanted to hack off the surplus, let her sole exfoliate a bit and then I could come back in the following weekend and nip again and rasp to finish it. Here is the Left Front. The frog is getting ready to shed and the sole has taken a bit of abrasion. I had nipped at a 45 degree angle and it was LOWER than the "sole" just 2 days ago. With the false sole in contact with the ground, it had a chance to shed a bit. 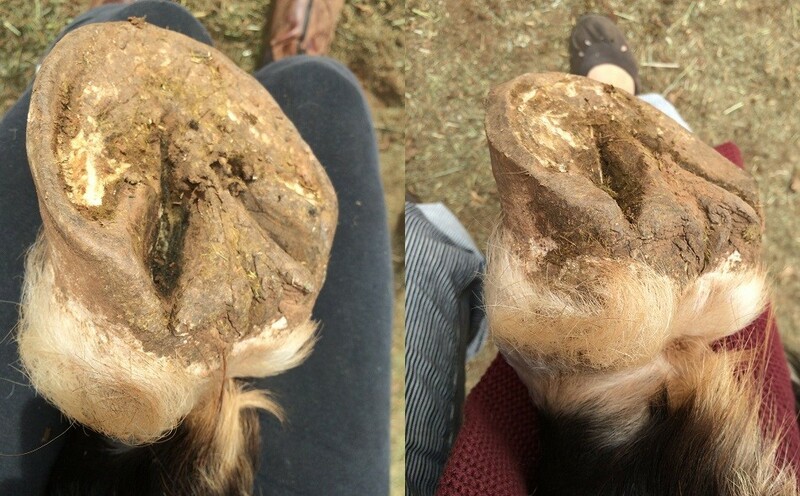 Her hoof wall is factually still longer than her sole. Her sole, factually, still has some shedding left to do. Now that I am not traveling, I will be diligent to trim her weekly, and let the frequent small changes reveal a prettier hoof by the new year. While not the *exact* same angle, I did want to show the comparison of where the heels went when I trimmed them back. On the left, you can see the weight-bearing portion of the heel had moved forward, to better support the column of her leg. 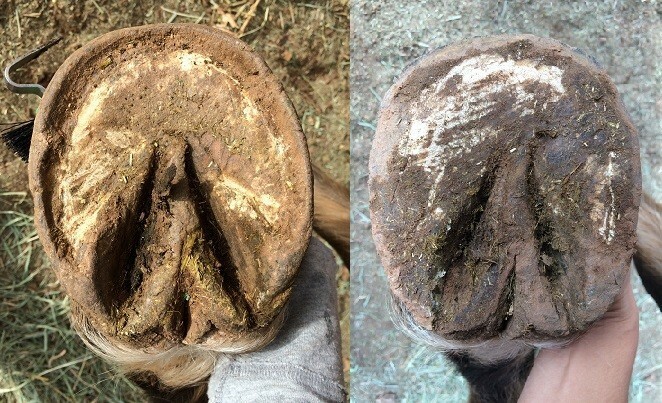 You can see where the frog spans the back of the hoof, much further back than the heels. After the mild trim, you can see (on the right) that the weight-bearing portion of the heels resides closer to the base of the frog. 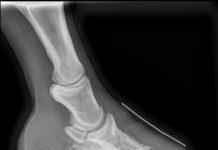 While I am dying to hack those puppies right off, I *can't* hack off much of her toe, as it hits live tissue, so I have to leave X amount of heel on there to keep the torsion off the toe in her break over. If I had my way, this is where I would like to see her hoof shape go, based on the new growth coming in. I know as soon as I want to change the hoof to make it look "visually better" (to me) I need to stop and review. I can only take off what she has there to give and can't get invasive for the sake of hurrying the process. I COULD. Seeing as she's not being ridden and lives the life of leisure, she is in no hurry, so I don't have to do anything drastic. I like where her frog is and the angle her new growth is coming in. I would want to tip the hoof in that direction and match the directions I think she is trying to work with. For now, she has too much live sole that I would need to hack off at the solar side of the toe, so we're going to wait and see what falls out on its own. 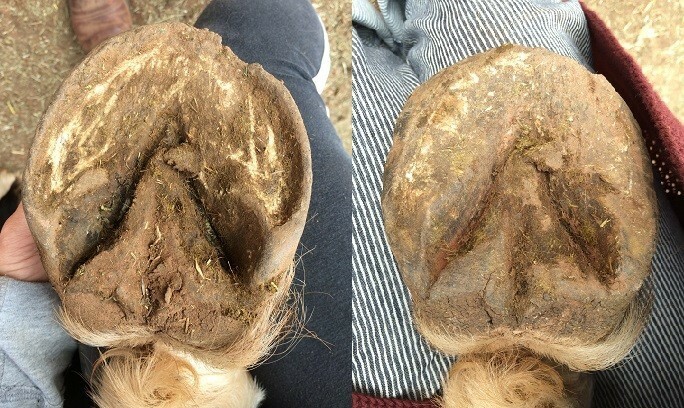 It almost looks like a different hoof! The frog shed down a layer (I didn't touch it). 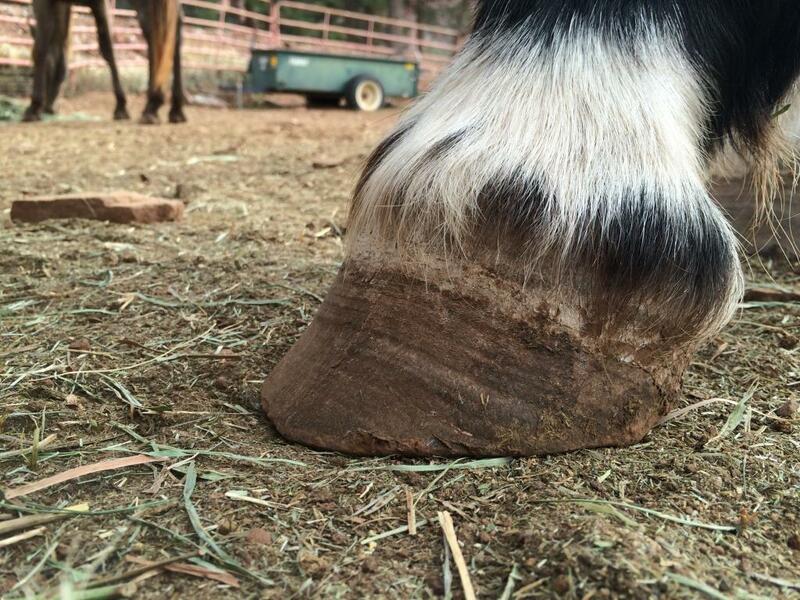 The sole has really flaked out and her hoof wall has all sorts of love that needs to come off of it. I took down the heels and bars and had beveled the toe with a deep 45 degree nipping. The hoof wall, just two days ago, was shorter than the sole and beveled off. 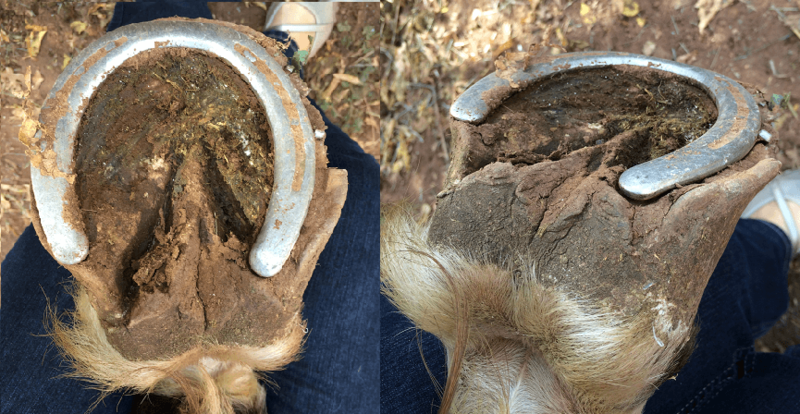 In two days, she has taken out enough sole to make the hoof wall "longer" than the sole again and, the 45 degree corner is worn off and flat again. As you can see, the heels were brought back and are more in line with the support of the frog, without being lower than the frog and causing it to be the sole supporter (no pun intended) in the caudal portion of the hoof. I like seeing the fissures on the back of the frog start to appear, as the frog is now moving and will shed its excess soon. Bit by bit, her new hoof will emerge. 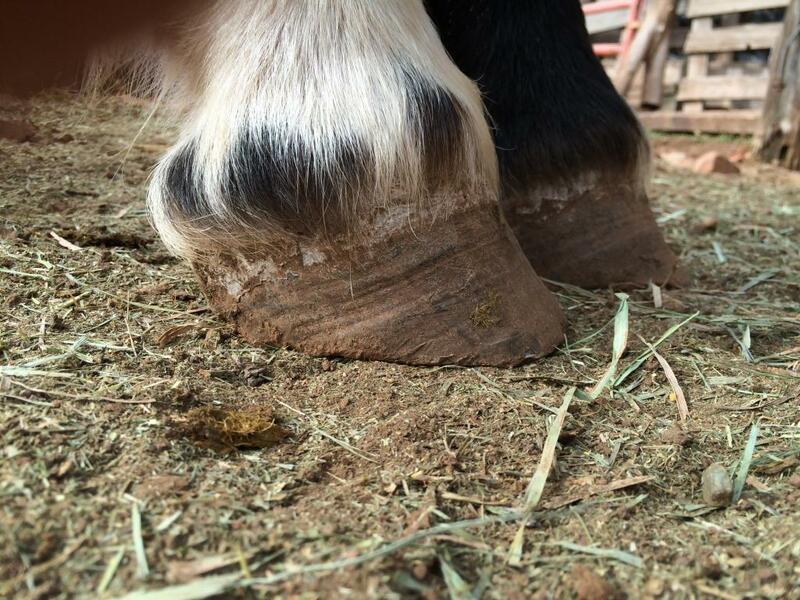 Mmmm, I love seeing ripples and ridges in the hoof wall. Reminds me of potato chips. I wonder if I should slather her in French Onion dip? Actually, I cringe when I see the feet she "has had" and I do mean that in a past tense sort of way, as the bits I don't like are already months in the past as far as growing is concerned. She actually has a bit of wooly fur that feathers down oh-so-slightly, so you can't get a clear vision of her coronary band and the health of what is growing in from this picture. But she doesn't have pushed up hairlines that mirror those two "lifts" in the wavy bands of her wall that seem to break her dorsal area into 1/3rds. We'll see how those grow out! Here is a profile shot of the Front Left and man, I want that heel to come down, but her frog is already in contact with the ground and I would like to see it shed its way off and then adjust, then wrongly assume the frog is going anywhere. What if it doesn't shed and she's left with a rocker for the back of a foot, balanced on the middle of a tall frog after I hack her heels off? I will be patient. I like that her hoof wall is no longer taking the support and this gives no pushback to the coronary band and not hindrance to her break over. What is growing in at the top looks tight and tidy. She'll be happy to have THAT hoof when it reaches the ground. Maybe by this weekend the entire sole will look different and my approach will shift. Read it each time you see it; don't plan ahead. What they give you is the gift you get to work with. If I knew I was going to go 5 weeks between trims, I would get more aggressive. Knowing I am going to trim her in another 4 days, not so much. Additionally, her ground is quite soft. If it were more hard packed, I would probably rasp back a lot of that toe and take the heel down a smidge. From here, her frogs and heels look supportive and neither taking on all the weight bearing caudal role. The toe area is still packed with sole that either needs to flake out or knife out. I will see what she does with it for a week, take new "before" shots and trim what I see then. I'm going for points of improvement from existing, not points away from perfection. I like how large and wide her frogs are on both of her hinds. In this Left Hind comparison, her foot started very triangularly. When she was shod, they were QUITE triangle shaped. 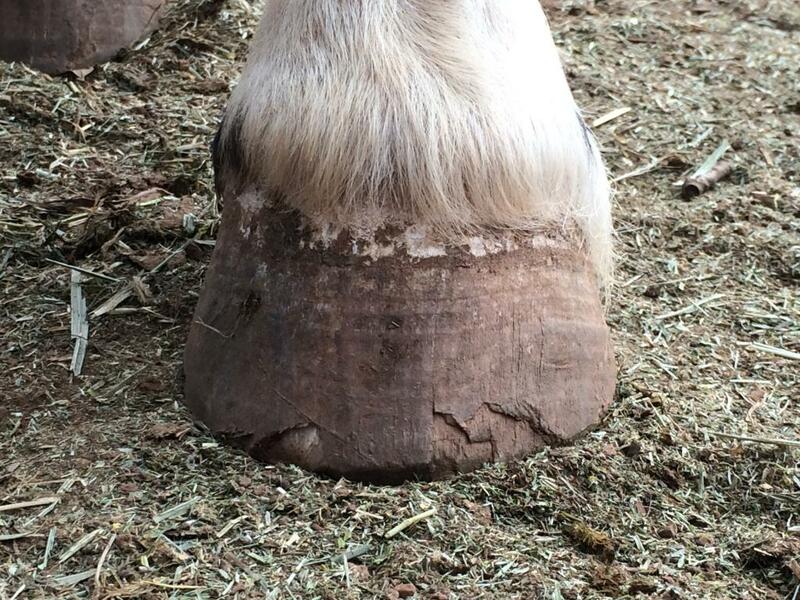 Now we start to see a more oval hoof emerging. Her heels were quite tall and the toe long. With the toe brought back and the heel lowered, we were able to keep the new growth angle happy, while getting rid of these pressure points of unevenness in her solar support structure. Here you can see how much her heels came down. You can also see the frog taking on more contact with the ground and a top layer of it has rubbed off. Here is the dorsal and profile shot of her Left Hind. Again, her fluffy hair tends to obscure where her coronet band is and the evenness of her hoof. I will be happy to see her dietary and supplement changes helping the quality of her hoof. Environmentally, she came off a dry sandy environ in Utah and is now in a softer, clay powder dirt, with less exposure to sun and more groceries and vitamins and minerals. She still likes to eat the tress branch clippings and is still larger than a house, so she's probably still missing something in the "diet change" plan. Either that or I've confirmed that her lineage includes Goldfish, which are known to eat anything put in front of them and not stop until they explode. 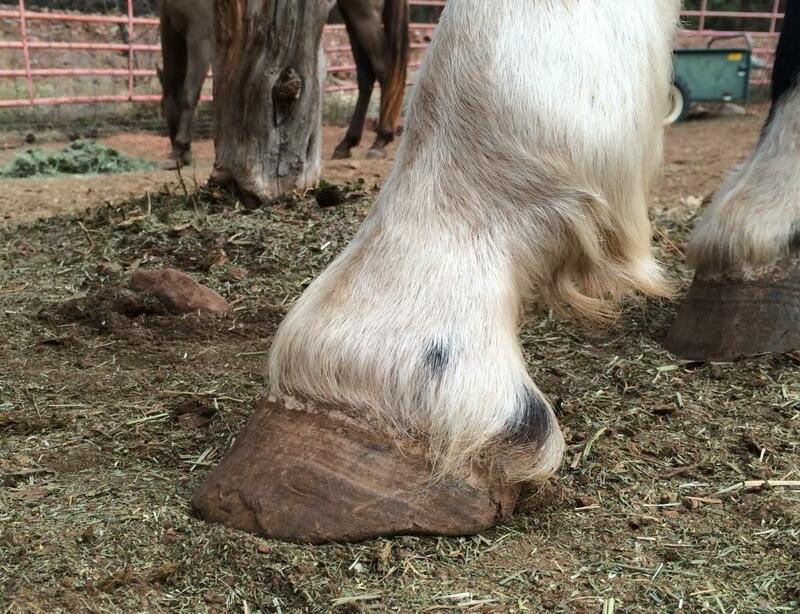 Again, her footing is a smidge soft, so some of her hoof is under dirt. She doesn't have a scoop in her quarter, as the shadow makes it appear that she does. This hoof has only a slight flaring down the dorsal plane, but is the most uniform in old growth matching the new growth coming in. What is notable is that both of her hinds, she has tried to keep her angles happy to herself, even while she had taller heels and longer toes. Her solution? She flared the heels out into a triangle shaped hoof. Now that the heels are trimmed and falling more "under" her instead of splayed to the side, she doesn't "have" a triangle hoof. 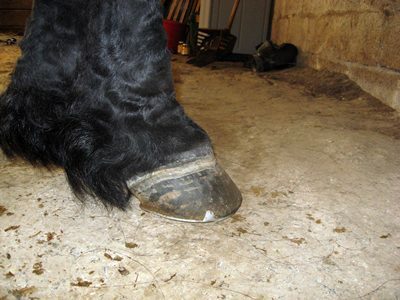 When I trimmed my Friesian, it was a common refrain that they "had" triangle rear shaped hooves. Not so. He just had long heels that he avoided by letting them go sideways. Once the bars and heels were convinced to stay under him and not splay, he maintained a slightly oval hoof with no more triangles. There is a frailty in not READING a hoof and then shoeing what you strongly believe is their genetic way of growing it. You are encasing pushed-up heels and holding in the flare that was heretofore relieving pressure. Oh, but don't they have such a plucky turnover in their gait now! "Avoid, avoid, avoid the ground" I hear those plucky feet saying. It's harder to see pushed up hairlines when you have horses with that much feather. Out of sight out of mind. Lift those Bad Larrys out of the way and assess your new growth. Often on Gypsies and Friesians, they "see" the angle that is already 2 months too old and don't handle high heels and flares. They start to trim in 2D by only seeing the solar plane and trimming that, without regard to the new growth angle or the pressure feedback from the ground up to the hairline. 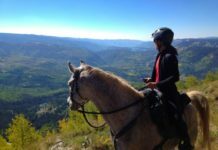 This owner wrote into a horse blog that his horse was lame and he thought the feather was causing his horse's problem. Even after hacking off the feather and exposing that poor, tortured, pushed-up coronet band and the wondrous angles that had his feet had been shaped into, he still believed it was the feather causing the issue and was shaving the feather and applying Betadine and ichthammol to the coronet band to handle the "hair fungus" that he thought was causing an ugly coronet band and poor hoof growth and lameness in the limb. Here is another view. 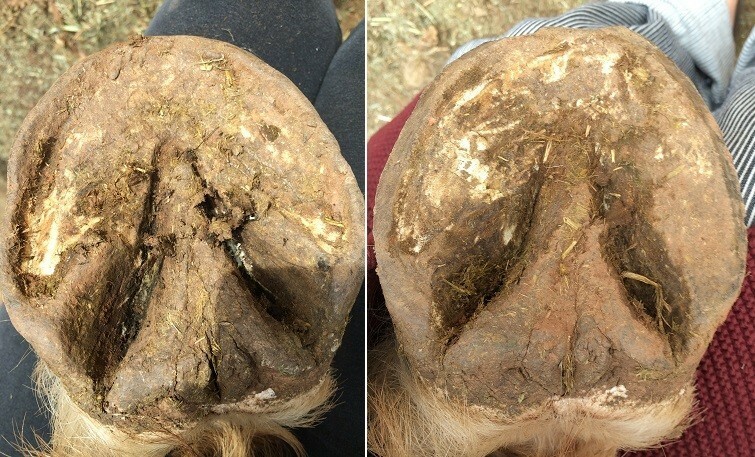 If the hair was still there, you would've never noted the angle of the new growth and where the hoof wall has started stretching away and changing slope. You would've never read that it had a long toe. 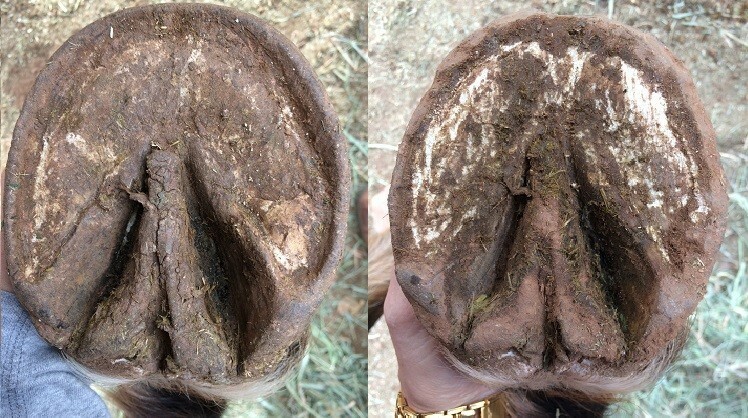 Heck, if you cover the top portion of the hoof with tons of hair, you see a very compact, uniformly angled hoof emerge from the bottom. In fact, if you covered up that top angle, the remainder of it would look pretty nice! You would never see the heel pulling in and the hoof visually bound and contracting in the new grown coming in. This is the same horse that then developed that very vertical, very pinched upper hoof capsule with a pushed up, swollen coronet band. Slightly different angles in the photos, my apologies. It was interesting to see her foot "pointing" to the right. Her outside heel wall flares out and her toe wings in. Her frog also flares out and is more crushed and collapsed on the inside. I get impatient seeing imperfect feet and I have to remember how much we adjusted and hacked off when we took her shoes off, just 6 weeks ago. She's been sound the whole while, so no sense in getting aggressive now! As you can see from the various views below, her outside flare is not being continued. Her heels are sharing the weight-bearing portion in the caudal area of the hoof and her dorsal angle seems to be coming in tight. She appears to almost be at the angle she wants and has little toe stretching. When trimming her, there is little sign of stretching in the laminar connection at the toe. I would prefer to put Stella in Gloves and I think those will be her boot of choice. Right now, she's getting rid of a bell of flare that was caused by her prior shod life. 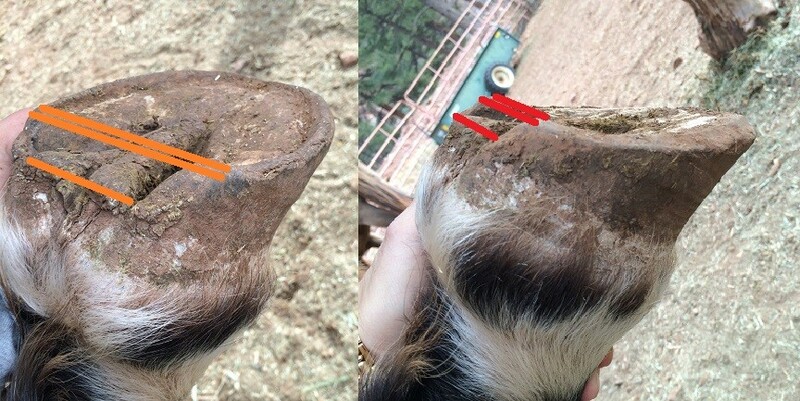 It's one thing to have flare at the bottom edge of the hoof wall, but when the flare is kept shod and "supported" the connection all the way up the hoof is strained and stretches. 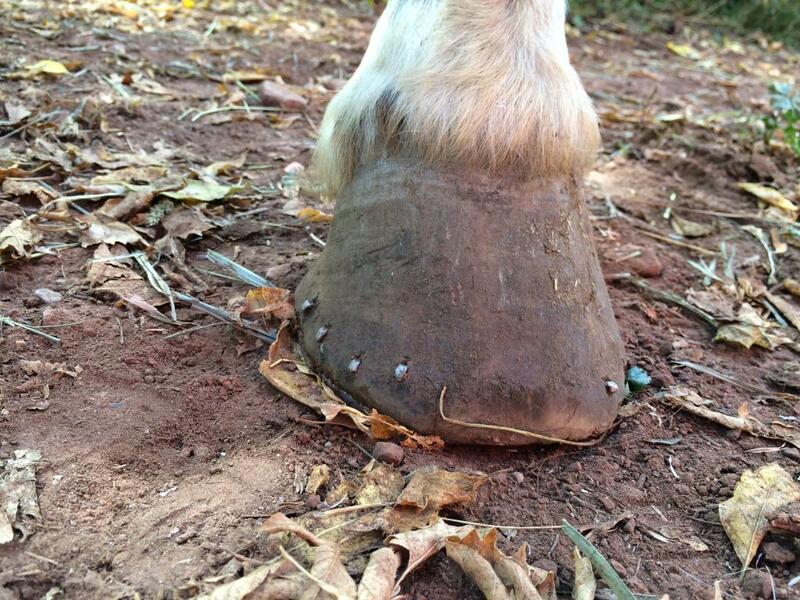 Your flare "starts" well up the hoof wall. 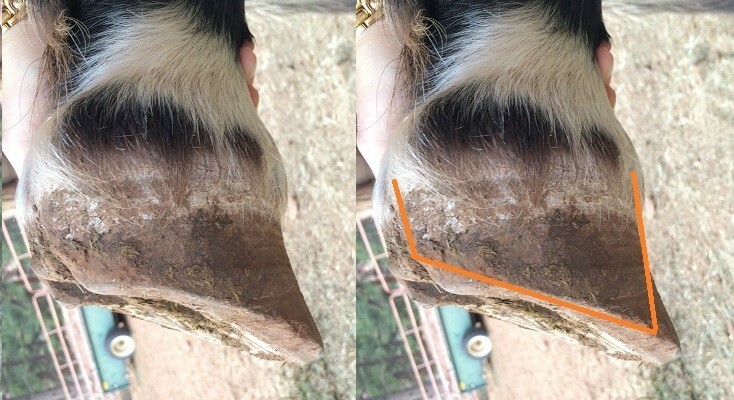 Shame that trimming the bottom growth and relieving pressure doesn't automatically mean that the hoof slinkies back into a tight shape again. The laminae don't just cuddle in and hug each other and hold tight again. Like spandex that has been pushed beyond it's elasticity… or tighty whiteys that are not so tight and not so white any more. You can't go back, you can only go forward. 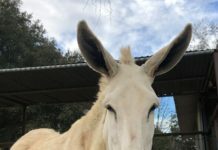 She will need a new set of hooves that are uniformly tight again, with good connection. All I can do is keep the hoof wall from flaring out and causing new stress and tears and let the whole new growth remain tight until it reaches the ground. Then I will also know her actual size. If I bought Gloves now, I am betting dollars to donuts that she would need at least half a size smaller by the time the bell flare had grown down and out. I could be wrong. 🙂 But I'm willing to learn as I go and I won't be wrong going slow. 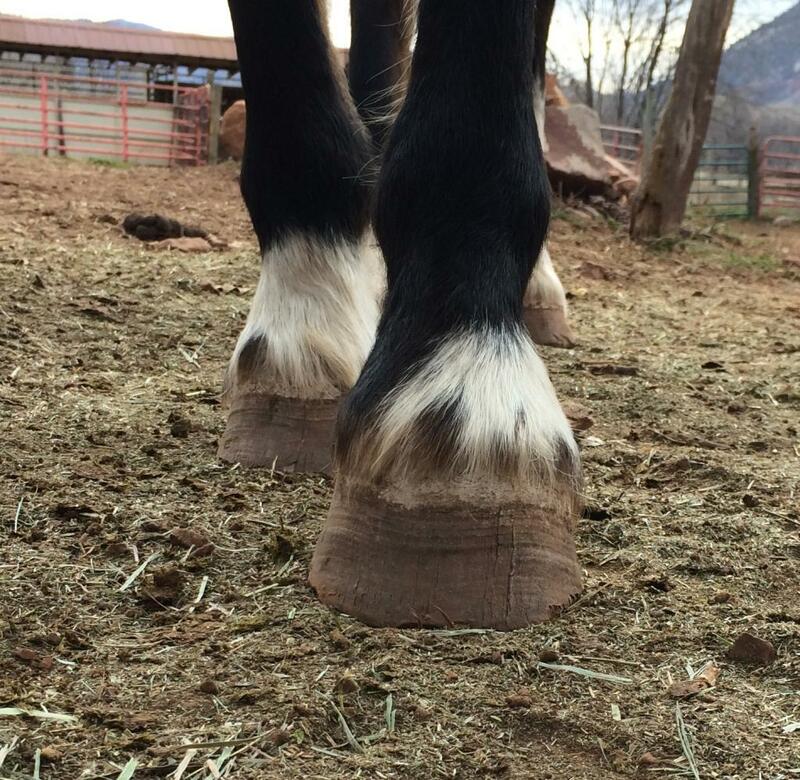 I have great hoof care practitioners in my midst here in Durango and I love keeping up trims on a weekly basis and calling an expert in to keep Stella on course.